The three-ball could be the deciding factor in tonight’s VCU v Princeton game against a Tigers team that loves to shoot it. Seven years ago a VCU team led by first-year coach Shaka Smart jumped out to a 5-1 start with a huge non-conference Power 5 win over Oklahoma and two sneaky-good Ws over Nevada and Rhode Island, teams that would ultimately prove to be top-100 victories. But up next came William & Mary, a squad of gunslingers who would end up ranking 4th nationally in percentage of points scored via the three, an experienced group that could absolutely shred defenses with their shooting and cutting offense. The Rams went on to lose that game to drop to 5-2 but have a chance to move to 6-1 tonight for the first time in 22 years against a very similar opponent when and even more talented and even more experienced Princeton Tigers team visits the Stu tonight. You’ve heard of the Princeton offense by now, no? Well, guess where it gets its name from. Sixth-year head coach Mitch Henderson will lead his version of the Princeton offense into the Siegel Center with the Ivy League’s preseason No.1 looking for an upset and major feather in their cap for the 2016-17 season. It will be the Tigers’ second top-100 road game this year and fourth road game overall. The Tigers won just one of their previous road contests, a 16-point win at Lafayette but fell to their two top-100 caliber opponents in BYU (kenpom No.61) and Lehigh (No.105), both in highly competitive single-digit defeats. On paper they’ll face their biggest challenge tonight when taking on a Rams team that is both the highest ranked team they will have played and one that boasts the toughest defense as well. The Tigers have been a little slow to warm up this season despite returning an experienced group that includes six seniors and three juniors. Princeton returns every key piece from last year’s team including last season’s leading scorers Henry Caruso (15 ppg, 6.2 rpg last year), a 6’4 senior guard and Steven Cook (13.8 ppg last year while shooting 44% from three). The Tigers shot a blistering 38.7% from deep last season and connecting on 52% of their twos, both stats ranking around the top-50 to combine for an effective field goal offense that ranked 24th nationally. Defensively the Tigers are solid but in terms of size and athleticism are find behind the teams VCU faced this past week in the Bahamas. What they lack in those areas they make up for in discipline. In short, what we have here is a team that plays incredible team basketball. The Tigers are an NCAA tournament hopeful and with that are dangerous and hungry for a big road win tonight. Record wise VCU is off to their best start in years, yet currently lacks the key wins they’ll need come NCAA tournament selection time. After seeing an eight-point halftime lead over Baylor dissolve, one such opportunity escaped. The two following wins over LSU and St. John’s were solid but ultimately may not rank in the top-100 category VCU would like. Enter: Princeton. The Tigers offer up a legit shot at what could become the Rams first real resume-building win. Statistically there’s so much to like about this year’s VCU team. The Rams are hitting shots for a 55.5% effective field goal percentage that ranks 36th nationally. VCU’s D checks in at 26th in the country and perhaps what’s most promising is those numbers are there despite a roster head coach Will Wade is clearly still trying to figure out, or “crack the code” as he might say. Point guard play has looked incredible for VCU as of late, a great sign considering the Rams are one of the few teams in the country that employs a two-point guard offense. 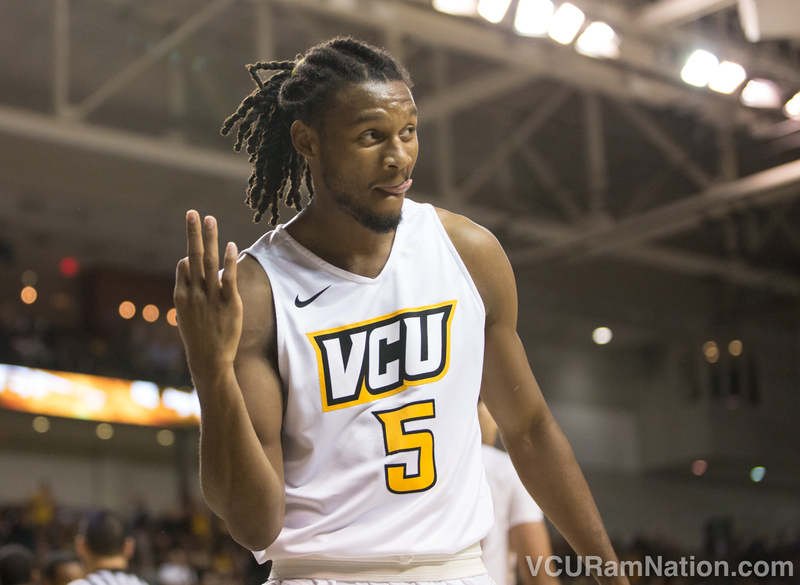 The Rams struggled with turnovers early but thanks to that two-PG lineup and some cleaning up of the offense, appear to be working the kinks out there, turning it over single digits in VCU’s two previous wins. Fouls however have been an issue all season as the Rams continue to adjust to new NCAA whistle rules, averaging 23 fouls per contest in the Bahamas and checking in at 256th nationally in defensive free throw rate. That area however could catch a breather tonight against a Princeton offense that checks in dead last in the country at free throw rate offense. Princeton ranked 249th nationally last season but 16th the year prior with many of the same players the Rams will face tonight. Tonight is about defense and VCU’s ability to communicate on that end of the floor. Princeton is very similar to the likes of Richmond and Davidson in how their offense operates. It’s a thing of beauty if you’re a fan of those teams and a serious source of frustration if you’re rooting against them. The Tigers love the three ball and will certainly die by it if it’s not falling (note: every Princeton player on the floor will launch if from deep), but can also kill you with cutting offensive players if you aren’t paying attention. The Rams will no doubt have an athletic advantage tonight, and having watched these Tigers I can tell you there’s not one player on their team that should be able to stay in front of JeQuan Lewis or Jonathan Williams on defense. The Rams will also have a size advantage in the paint should they choose to use it, but don’t be surprised if you see more Burgess than Tillman — and small ball in general — in a game like this thanks to the constant threat of the three-ball from the Tigers. If VCU can force Princeton to play their style of play, I love the Rams’ chances. It’s simple with the Tigers: if that three-ball is falling there ain’t much you can do. The three is the great equalizer in college hoops and is exactly how VCU made a Final 4 run — by setting an NCAA tournament record for made threes. Princeton will shoot em, so it’s up to VCU to stop em. A poor three-point shooting night for the Tigers likely equals a 6-1 start for the Rams. Kenpom: 70-65 VCU win with a 68% chance of a Rams victory. Game tips at 7PM at EJ Wade Arena (aka “The Stu”) in Richmond, VA.
Watch: MASN, Official game day headquarters are Buffalo Wild Wings locations at Virginia Center and downtown on Cary Street in Shockoe Bottom.